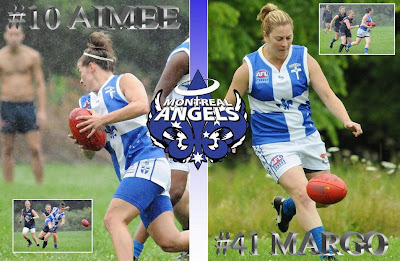 Sisters Margo and Aimee Legault will become the first Montreal Angels, and first Quebec born players under the Quebec Saints football development program to represent their country today when Canada Northern Lights take on the United States Revolution in women's Aussie Rules football. The Montreal Angels headed to Toronto for the first time to take on the Blues. In a downpour the bleu et blanc dominated play despite some questionable physical play from their opponents. It was once again the unstoppable play of the Aimee and Margo Legault that led the way from the centre. The backline pressure of Mimi and Roasty restricting a Blues team that had a full bench but still could not out-run the Angels. 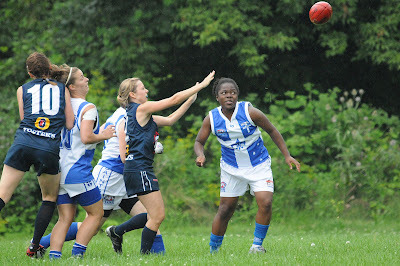 With Uche and Danielle up forward with surprise packet rookie Kathrine also contributing the Angels extended their record to 4-0 over the Blues.